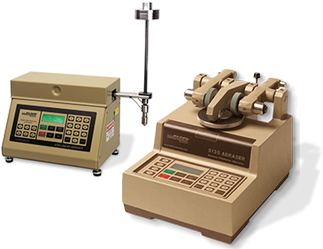 The Taber® Crockmeter - Model 418 provides a quick and accurate method to determine the amount of color transferred from textile materials (such as fabric, carpeting, yarn and leather) to other surfaces by rubbing. The Crockmeter has also been employed to perform rub abrasion, scuff and / or mar tests on flat specimens. Plus, it can be used to conduct smudge and smear resistance tests on images produced by a printer or copier. Regardless of specimen material, both wet and dry testing can be performed. Originally designed to simulate the action of a human finger and forearm, the Crockmeter uses a standard pressure and rubbing motion to provide reliable and reproducible test results. Specimens are positioned on the base of the Crockmeter and held in place with the sample holder. To prevent the specimen from shifting during testing, a sandpaper pad is provided to place under the specimen. A hand crank moves a reciprocating arm a distance of approximately 100mm. The rubbing action is provided by a 16mm diameter acrylic "finger" which moves back and forth in a straight line with each complete turn of the crank. 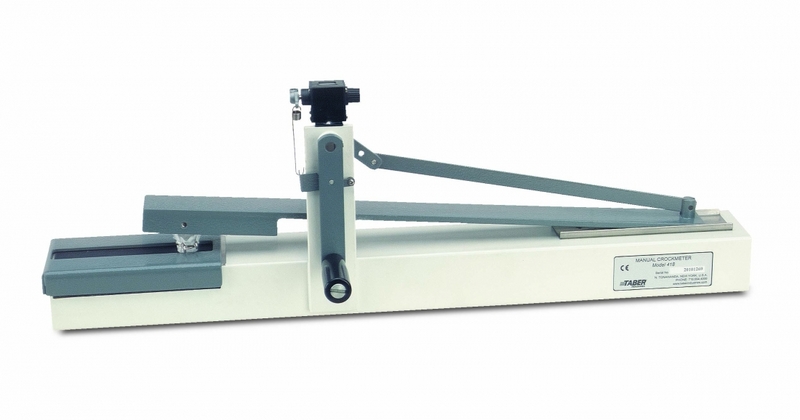 The reciprocating load arm is weighted to provide a constant 9N load on the sample at all times and a mechanical counter keeps track of completed cycles. Other abradants that might be used with the Crockmeter include felt, duck cloth, laboratory grade denim, coated abrasives (e.g. Polishing Paper, 281Q 3M WetorDry™), etc. Typical evaluation for textile Crockmeter tests involve visually comparing the amount of color transfer / staining against a standardized color transfer scale. After rubbing the crocking cloth against a colored test specimen for the prescribed cycles, the crocking cloth is removed from the instrument and the amount of color transferred to it is compared to a known scale and assigned a grade. Two popular scales include AATCC Gray Scale for Staining or the Chromatic Transference Scale. For repeatable and reproducible test results, it is recommended that specimens be evaluated in controlled lighting and at a specified angle. When using the standard 16mm diameter crock finger to test pile fabrics (such as textile floor coverings), there may be heavier staining on the circumference of the stained area of the crocking cloth. To resolve this, Test Method AATCC 165 describes using a "crock block" measuring 19.0 x 25.4mm. The following link provides a listing of test methods the Taber Crockmeter (Crock Meter) satisfies. Please note, additional accessories may be required.